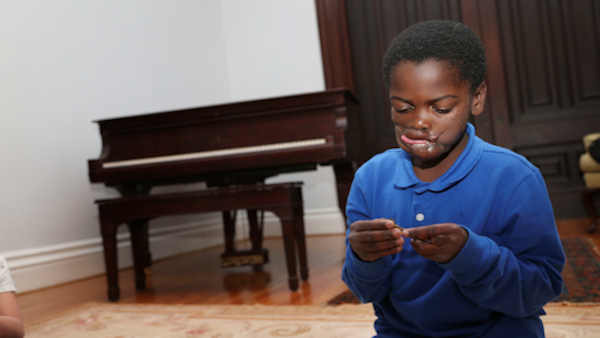 STONY BROOK, NY -- A Congolese boy who was severely disfigured in a chimpanzee attack is marveling doctors with his resiliency a year after he was brought to New York to undergo reconstructive surgery. Nine-year-old Dunia Sibomana was the lone survivor three years ago when chimpanzees attacked him and two playmates near a preserve in Congo. His 4-year-old brother and a young cousin died. Dunia's face was left a frightening mask. His lips were ripped off, his cheek was torn apart and he was left with muscle damage that made it hard to swallow or communicate. In January, Dunia underwent a rare surgery at a Long Island hospital that involved grafting tissue and muscle from his forearm to recreate his lips. He still has a lot of healing ahead of him, but nearly a year later, Dunia is thriving with a host family in Brooklyn. He can once again open and close his mouth, eat and talk normally. And doctors and his host family say the boy, who was once self-conscious, shy and withdrawn, has blossomed. He has become fluent in English, learned taekwondo, soccer and surfing, and made friends in his new neighborhood. "He has a ton of friends. He can't walk down the street without people stopping to give him a high-five," said his host father, Kim Chaix. "It's New York City that's really raising this child." Dunia lives with Chaix, his wife and their 9-year-old daughter Annabelle, who walks to school with Dunia arm in arm. On a recent afternoon, Dunia played video games with Anabelle before reading the Dr. Seuss classic "The Cat in The Hat." "There's a connection between them," Chaix said of Dunia and his daughter. Dunia affectionately calls Annabelle "Goldie," after her golden hair. She reads him books at bedtime and makes him snacks. Dunia, who hadn't attended school in Congo, is now in second grade. 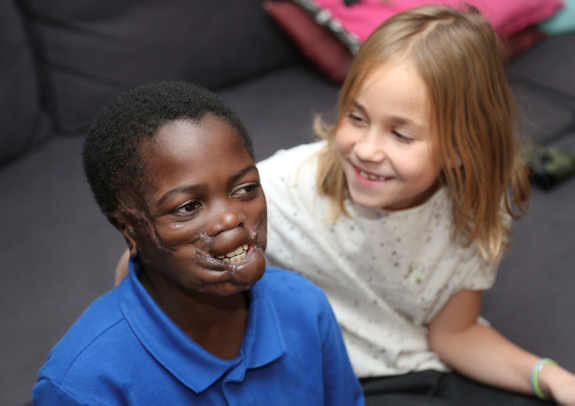 "A lot of the social stigma that he came with is now gone," said Dr. Leon Klempner, an assistant professor of dentistry at Stony Brook Children's Hospital, who helped bring Dunia from Congo last November with the help of the nonprofit foundation Smile Rescue Fund for Kids. "He's got a lot more confidence now. He doesn't get the stares that he used to get." Dr. Alexander Dagum, the hospital's chief of plastic and reconstructive surgery, said he knows of only three other cases in which the same surgery has been performed. The hospital is covering the cost of the surgery, and the doctors have all donated their time. Dunia has not lost complete touch with his homeland. He spends weekends with a family from Congo, brushing up on his heritage and native language of Swahili. Dunia's mother died several years ago. His father still lives in Congo in an area without regular access to phones or internet, but the two communicate via videos they record for each other. Intermediaries deliver the recordings to Dunia's father. Chaix said it's still unclear what Dunia's future holds - whether he'll stay in the U.S. after the school year or go to a boarding school in Rwanda. Chaix said Dunia once told him he didn't ever want to go back to Congo or speak Swahili again, but after spending time with other people from his home country and buying some traditional African clothing, he's "embraced it." "We've all grown from this whole experience," Chaix said.